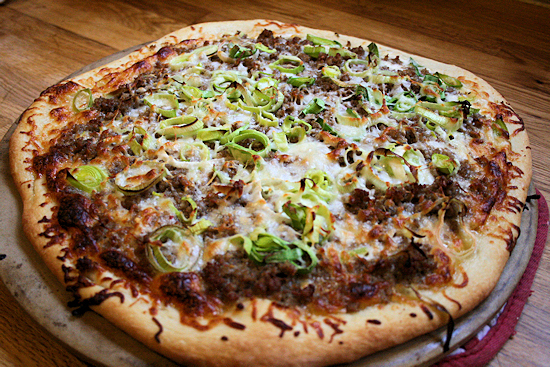 Gourmet Pizza 3-ways w/ Store Bought Crust! 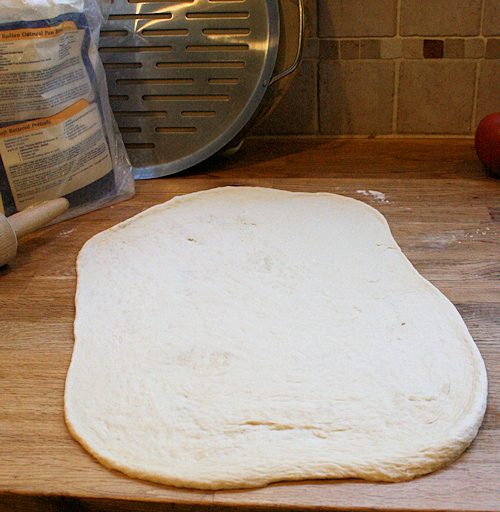 So i have not yet made my own pizza dough. I haven’t. I am not sure why, but something in me is fearful of failing at this almighty pizza dough thing. This has not, however, kept me from finding the perfect store bought pizza dough and this is exactly what I have finally done! No, they did not give me this pizza dough or ask me to try it. I was just lucky enough to find it one day and said “Eh, why not?” since I was not succeeding with any other dough. Well, BINGO! This is the one. It was unanimous amongst the house dwellers. I have found the perfect frozen dough. Now to recreate my favorites! 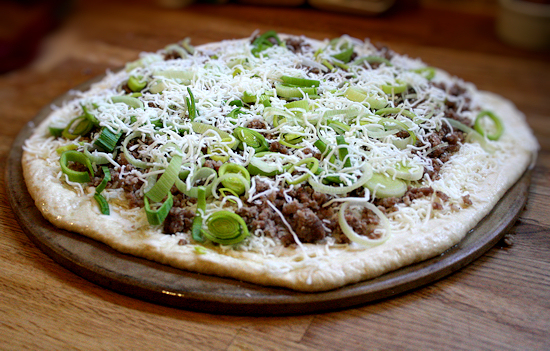 Creamy leeks and sausage for me, the Soppressata inspired from A TAVOLA and of course a sautéed veggie pizza. 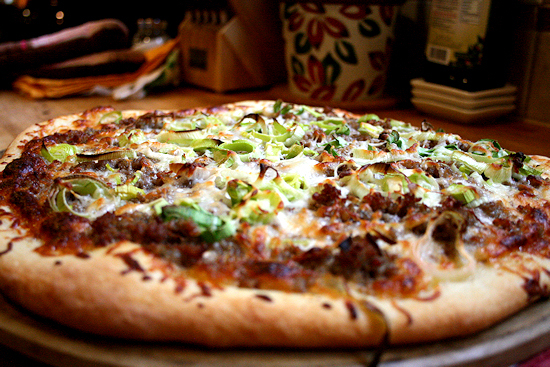 I wanted each crust to be different to let you see the choices out there for the home “pizzaiola or pizzaiolo. 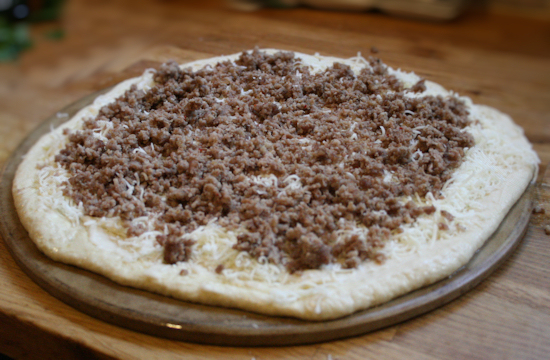 Below, I will be showing three different pizza flavors and styles of cooking. 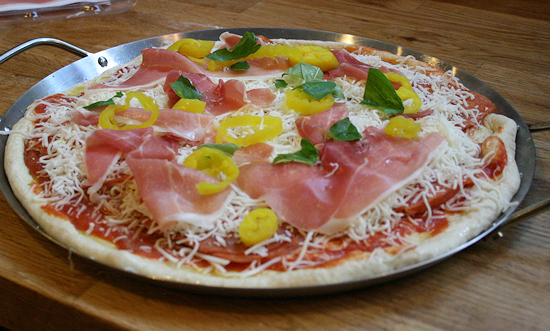 Feel free to swap out ingredients as needed or make your own special pizza! 1 leek chopped into rings. 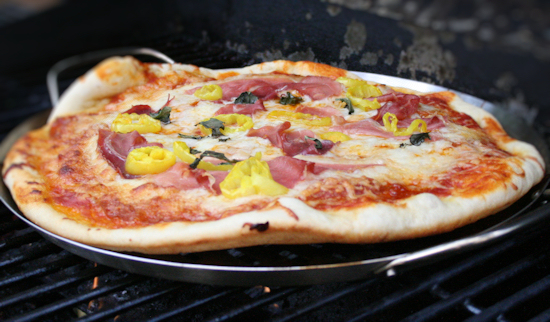 Your choice of pizza stone, pan for grilling pizza on the grill or you can simply use a baking pan for the oven. 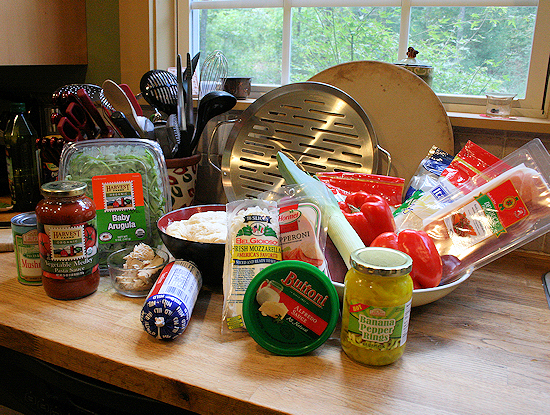 The first pizza I will be making is the veggie. 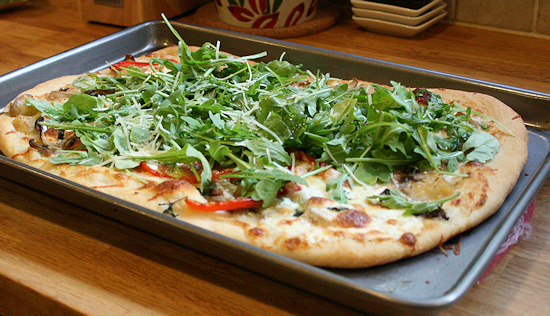 This is a more rustic square crust and done in the oven with a baking sheet. Set the oven at 400 degrees. 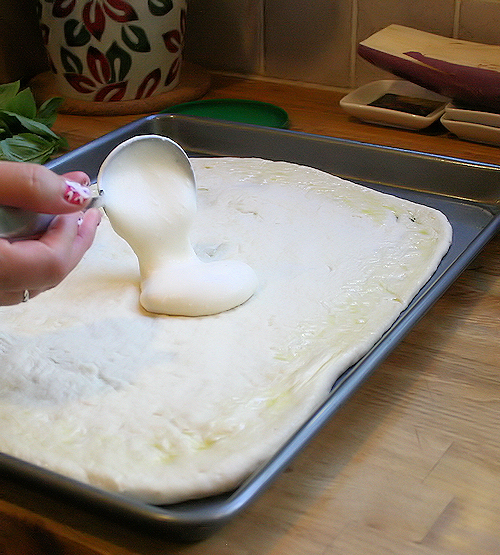 I started out with each pizza dough after letting them rise from the time I woke up till I was ready to use them. Eight hours usually, in a bowl oiled with olive oil and covered. They were perfect. 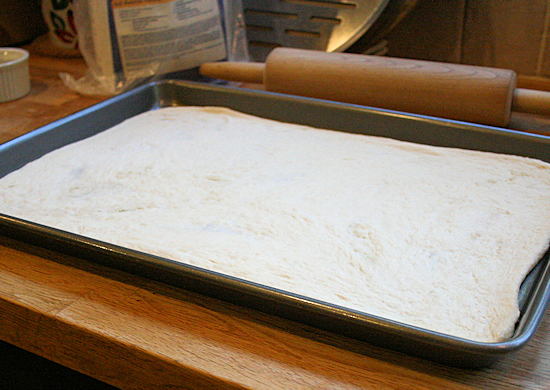 I dusted the counter with flour and laid the dough on the flour, coating each side. I kneaded the dough, pulled it and shaped it with my hands and a rolling pin until I got the shape I needed for each pan. 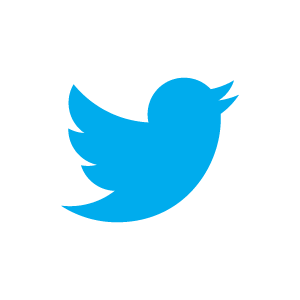 For this pan, I went with the square… well, rectangle. 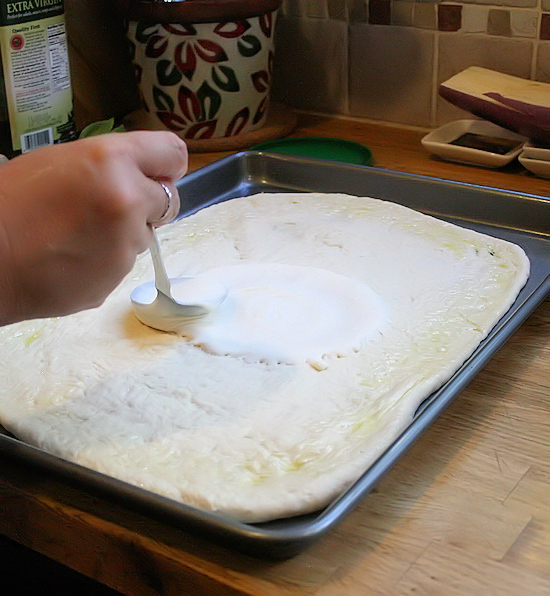 Lay it on an oiled baking pan and gently stretch it to the size of the pan then set aside. Now for the veggies. You can use any veggies you’d like. 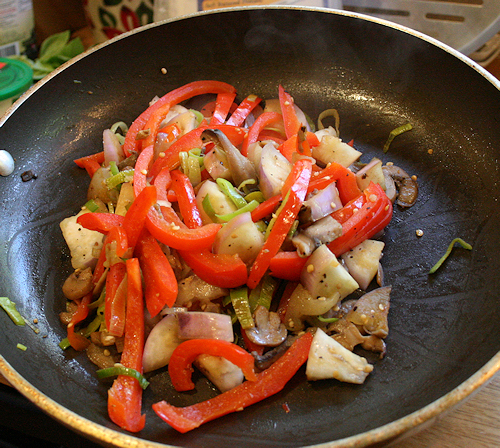 I used peppers, leeks, mushrooms, garlic and white eggplant. 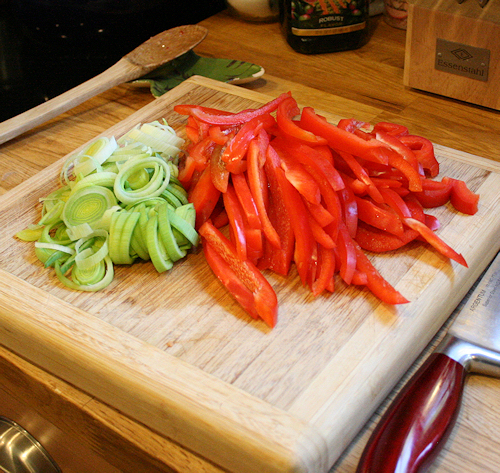 Pile all the veggies into a pan, add a splash of olive oil and sautée them until they are al dente. Hot but still crisp and colorful. Get your square crust out and brush each of the sides with olive oil. Take about 3/4 of a cup of the alfredo sauce and ladle onto the square crust. 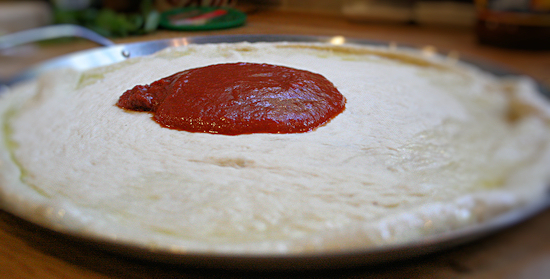 Gently move your sauce to all edges of the crust. With this one, I did not want a heaping amount of sauce as I want the vegetables to shine through in keeping with a rustic pizza theme. 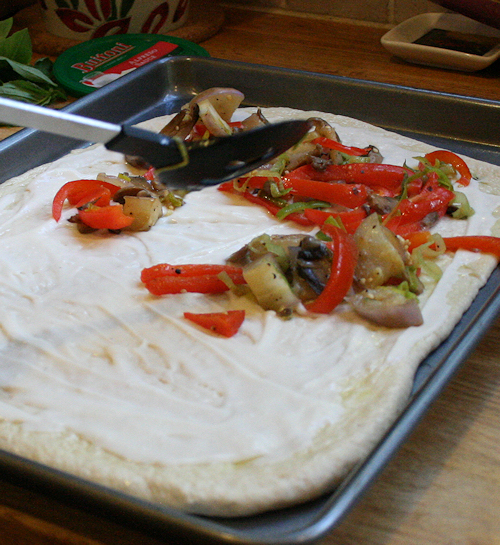 Add the vegetables and spread out onto the pizza. 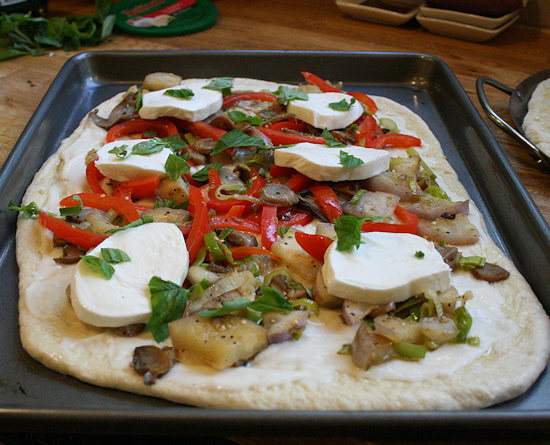 Next, take the fresh mozzarella and place on the top but not too close together and not a lot. Enough so that each piece has one piece of the cheese. Beautiful! Bake at 400 for about 30 min until the crust looks nice and brown and the center is nice and hot. 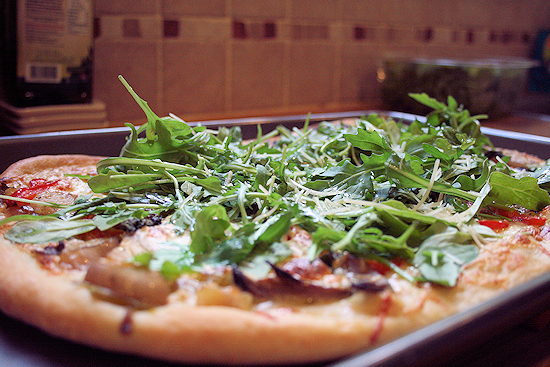 Take out and top with fresh baby arugula. Next is my favorite done on the baking stone in the oven as well. 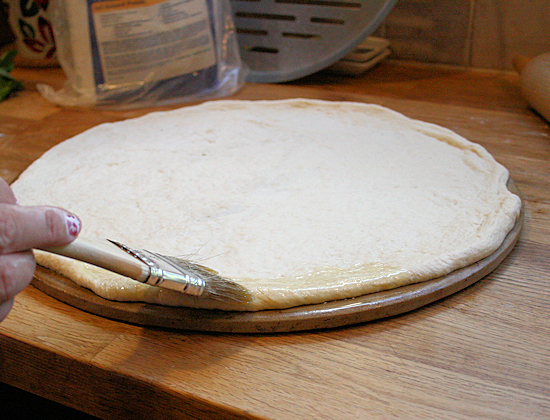 I followed the same steps with the dough only this time doing a circle and placing on the stone that was oiled as well. Be sure to brush the edge with olive oil. 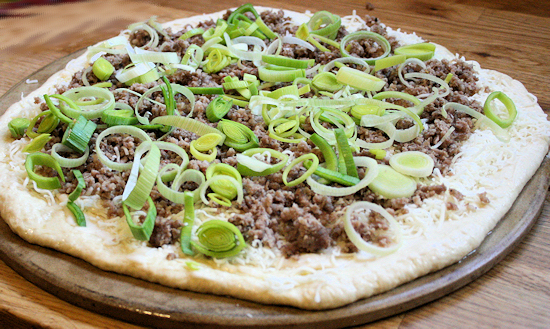 Add your sausage on top and be generous. You want the entire pie covered. Looks yummy already. 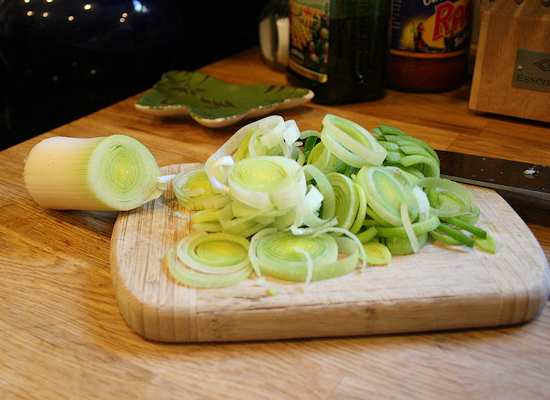 Next, add the leeks you diced earlier. Layer them on top of the sausage. 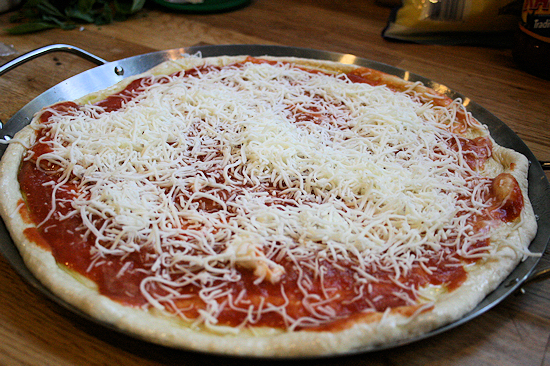 Take a handful of the mozzarella and sprinkle on top to make everything melt together in the oven. This will go in the oven at the same baking temp as the first. They CAN go in together at the same time and will cook about the same time. 30-40 minutes at 400 degrees. When it’s done, it will look like this! I can’t even describe the flavor on this one. If you are a sausage lover, this is a must try. Finally, the Sopreseta, for the spicy Italian lover in the family. 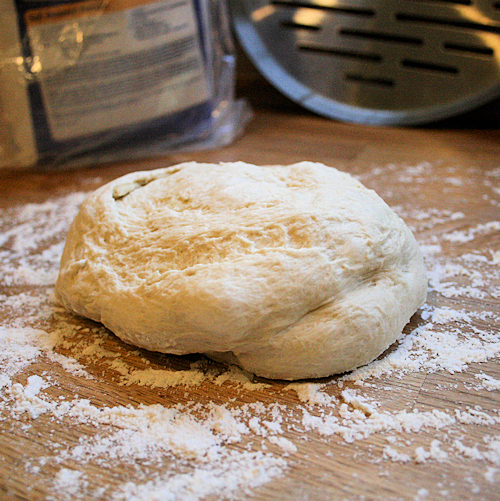 Again, start with the dough in the same manner. The only difference is that this one is going on the grill! I was given this grill pan for Christmas and had yet to use it, well today is the day. I must say i loved, LOVED the dough on this one when grilled. Start this one with your marinara sauce and push to the edge. Not too thick. Add a dollop of what is left of the alfredo. 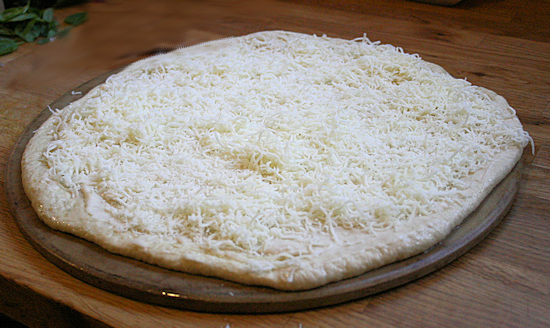 Next add a light layer of shredded mozzarella cheese, 1 cup. 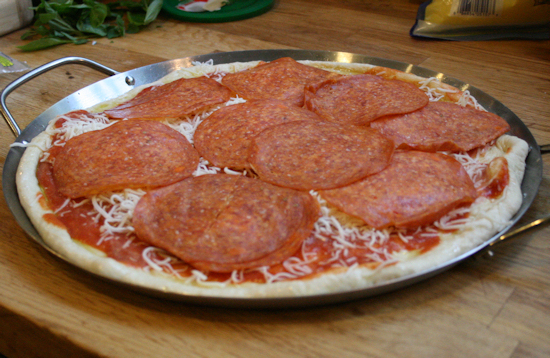 Next, add the pepperoni slices. The large ones work so nicely. Add the remainder of the shredded cheese. It should be about another cup. Take your three prosciutto slices and tear them into pieces placing them on the cheese. Add your banana pepper rings and some fresh basil. You are ready for the grill. The grill should be at medium to low heat. Place pan on grill and close lid. 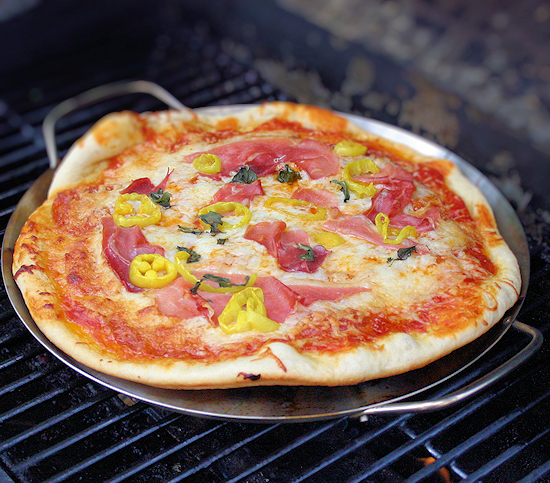 This pizza took about 20minutes on the grill as it kind of worked like a convection oven. The outcome was well worth it. Creamy and spicy with a nice grilled crust. Well, there you have it!! Three gourmet pizzas no doubt done the easy way, but I wanted to inspire you and show you everything you can do at home. My little one loves building her own so this is fun with the kids as well. 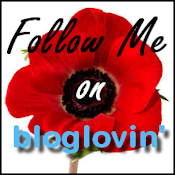 I hope you try one and love it as much as we did!